Sunday was a beautiful day here in New York. 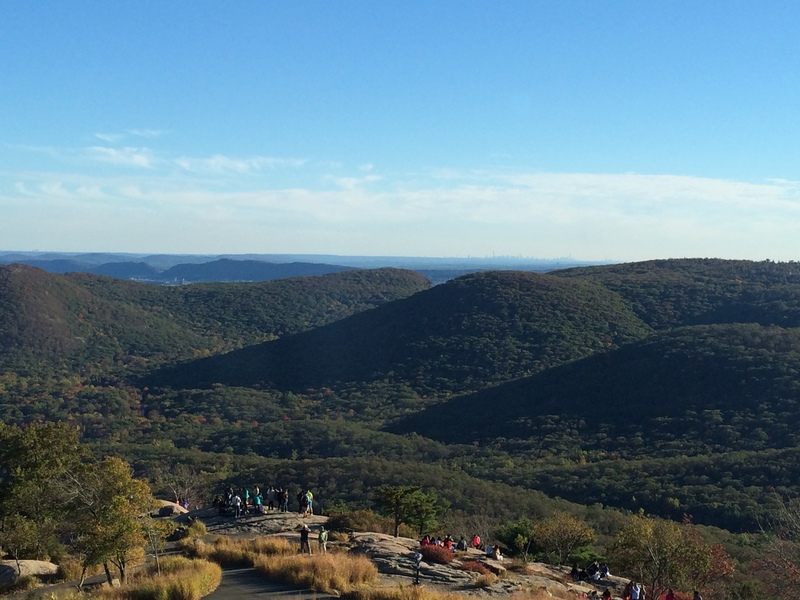 The rest of the week’s weather looks rubbish, so we decided to go on a day trip to Bear Mountain. Turns out we aren’t the only ones who look at weather forecasts and the rest of New York made the 75 mile trek north to share the roads with us. So much so that after a lovely stop off at Welch Lake, with my fabulous Bagel Bob picnic, that the entire road ground to a halt because there was so much traffic. We carefully made our way to junction 19 only to find that the only road into Bear Mountain was shut. A park ranger, who looked about 12, was fending off angry motorists who were, unsurprisingly a bit put out that no one had bothered to tell them at junction 18 that they couldn’t get into the park because it was jam packed already. When we got to this point, the woman in the car in front of us was so angry her daughter had to restrain her physically to stop her lamping the poor ranger. Not a great sight for J to see as I took him for a well earned pee in a bush nearby. I wouldn’t have minded not knowing at junction 18 if I could have then turned around at this point, but no, we then had to crawl through another 2 or 3 miles before we could do that. I think the parks department could do with sorting that one out, it can’t be the first time the park got busy on a warm Autumnal day on a holiday weekend (Monday is Columbus Day). So we consoled ourselves to having driven all the way for nothing, thinking we probably should have left earlier. We got to the roundabout to take us back the way we came and the road to the other entrance to Bear Mountain was clear, so we went round the roundabout again, drove down the road to be confronted with another barrier and another park ranger type, this time not 12 years old. He waved us on, and we drove into the park, thinking that can’t be right, someone’s going to stop us. But we kept going and somehow, despite all the traffic from before, we drove up Bear Mountain with no one else following us. It was quite surreal. We got to the peak, parked and had a bit of a wander and it was fine. Where was everyone? There were certainly people there, but surely all that traffic was coming here? Well, no, actually, it looks like they were all going to the Oktoberfest at the base of the mountain and if it weren’t for people wandering about with huge beer steins, you’d never have known. It was totally worth it. From the peak you can see the buildings of New York City in the far distance. You can breathe fresh air! It wasn’t quite in its full ‘fall’ glory, but there was a lot of colour around. And there are deer. Very tame, cute, bambi style deer who let you take their picture. And the only bear I saw was a lady holding a young baby in a furry bear type all in one job who didn’t look very scary at all. The view from the top of Bear Mountain, look for the New York City skyline on the horizon on right hand side. Categories: Tourism | Tags: Bear Mountain | Permalink.